Workers are protesting about pay and want their hourly rate to rise to $15 from around $9. Fast food workers in 60 cities across the U.S. walked off the job Thursday as they protest for higher wages. Workers from fast food giants McDonald's (MCD), Burger King (BKW), Wendy's (WEN) and Yum Brands (YUM)-owned KFC are calling on their employers to pay them a minimum of $15 an hour and allow them to form unions without retaliation. Currently, the median pay for the fast food workers across the country is just over $9 an hour, or about $18,500 a year. That's roughly $4,500 lower than Census Bureau's poverty income threshold level of $23,000 for a family of four. 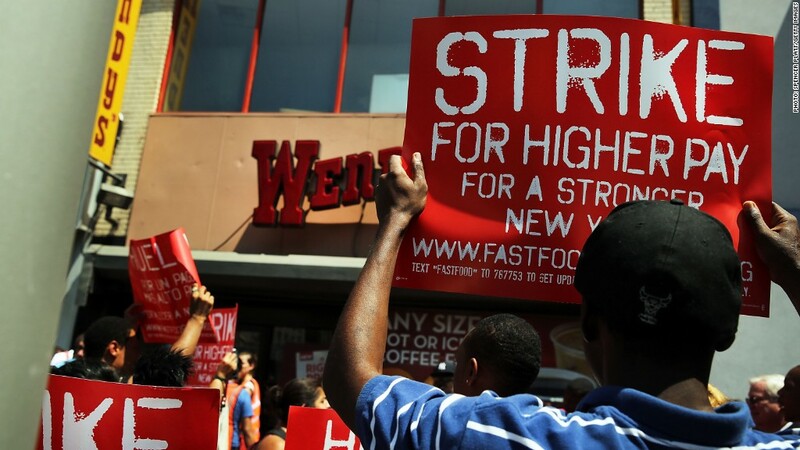 Organizers called the action the largest strike ever to hit the $200 billion fast-food industry. As of Thursday afternoon, they still did not have a precise estimate for how many workers were involved, but said the figure was in the thousands. Strikes took place in Boston, Chicago, Denver, Houston, Los Angeles, Memphis and dozens of other cities. A number of community leaders and local politicians joined the rally in New York City, where participants hearkened back to the Occupy Wall Street protests in speeches outside a McDonald's near the Empire State Building. "When I got here at the strike and I saw all these people, I was so amazed by the way that we came together for the same exact thing," said Tamara Green, who works at a New York City Burger King. The campaign, organized by a coalition of labor, community and clergy groups called Fast Food Forward, has been building momentum since last November, when the protests first hit the national spotlight. Retail workers from stores such as Macy's (M), Sears (SHLD), Walgreens (WAG) and L Brands' (LTD) Victoria's Secret also joined some of Thursday's protests, organizers said. Latoya Jemes, who's been working at a Memphis McDonald's for the past year, said ahead of the protests that she planned to join in. She makes $7.45 an hour, and has to work overnights because she can't afford childcare during the day. Her mother watches her children during the night. "I'm a single parent of three, and I'm living check to check," said Jemes, 24. "I only have enough to pay my rent, and I might be able to squeeze out the things that my kids need, but I'm not making enough." The protests have caught the attention of the White House. Earlier this summer, the "low-wage worker" protests were mentioned in a blog post written by National Economic Council director Gene Sperling and former chairman of the Council of Economic Advisers Alan Krueger. They said that raising the minimum wage was part of President Obama's economic vision. --CNNMoney's Emily Jane Fox contributed to this report.